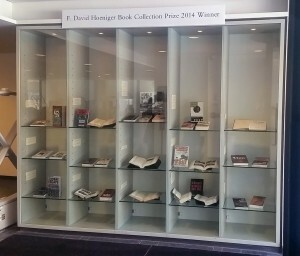 Every year, students registered at Victoria College are encouraged to apply for the F. David Hoeniger Book Collection Prize, an award named after the distinguished Victoria University scholar, author and editor. Candidates wishing to be considered for the award are encouraged to show some knowledge and appreciation of the items in their collections, not only for their contents but as books. Third-year Victoria College student Matthew Korda has been selected as the 2014 recipient for his collection on Twentieth Century European History. Matthew’s collection, currently on display at the E.J. Pratt Library’s front foyer, includes well-known titles on twentieth century European history, such as Art Spiegelman’s Maus and Vimy by Pierre Berton. There are other treasures as well: The Third Year of War in Pictures, published in 1943, contains an inscription indicating that the book was a bar-mitzvah present to a thirteen-year-old boy in England. The exhibition will be on display until March 27, 2015. The Friends of Victoria University Library are also holding their Annual General Meeting on Thursday March 26, 2015 at 6 pm in Old Vic Room 115, followed by The Hoeniger Lecture Series at 7 pm in Alumni Hall. The guest speaker is David Mason, a well-known bookseller and author, who will discuss “What Will We Do When There Are No Books? Whose Fault Is It?” Everybody is welcome to attend – please RSVP to s.gough@utoronto.ca or call 416-585-4471.